To reverse this demise, we need to feed our gut plenty of fibre. Specifically, we need polysaccharides, the complex carbohydrates found in plant matter, and we need a wide range, because different microbes require different polysaccharides.8 Research shows that there is a direct correlation between the food we eat, and the species of bacteria which responds: for example, the standard Western diet which is high in protein and fat produces greater proportions of the Bacteroides genus, while a high-carbohydrate, high-fibre diet, encourages higher numbers of Prevotella bacteria.9 The greater the diversity of our intestinal bacteria, the healthier our microbial community, and the better our overall health will be. So what should we do? Feed our second brain! Eat the following three types of food to encourage a higher diversity and population of the right kinds of bacteria for optimum health. 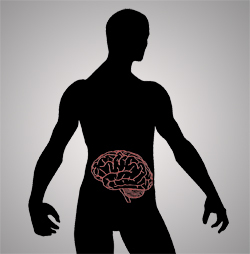 1 The Good Gut: Taking control of your weight, your mood and your long-term health, 'Gut Feelings: The 'Second Brain' in our gastrointestinal systems' [excerpt], Justin Sonnenberg & Erica Sonnenberg. 2 The Good Gut: Taking control of your weight, your mood and your long-term health, 'Gut Feelings: The 'Second Brain' in our gastrointestinal systems' [excerpt], Justin Sonnenberg & Erica Sonnenberg. 3 Enteric Nervous System in the small intestine: Pathophysiology and clinical implications, PubMed Central, Behtash G. Nezami & Shanthi Srinivasan. 4 From Structure to Function: the ecology of host-associated microbial communities, PubMed Central, Courtney J. Robinson, et al. 5 Cute Family. And you should see their bacteria, New York Magazine, John Swansburg. 6 Food processing: a century of change, British Medical Bulletin, 2000, 56 (No 1) 1-17, R.W. Welch & P.C. Mitchell. 7 Cute Family. And you should see their bacteria, New York Magazine, John Swansburg. 8 Cute Family. And you should see their bacteria, New York Magazine, John Swansburg. 9 Eat these 3 foods for a healthy gut, Johannah Sakimura. 10 Eat these 3 foods for a healthy gut, Johannah Sakimura. 11 Eat these 3 foods for a healthy gut, Johannah Sakimura. 12 Eat these 3 foods for a healthy gut, Johannah Sakimura.